Henry Kapono shares the stage and audiences with some of Hawai'i's most renowned and upcoming artists in concerts that "Celebrate the Soundtrack of Hawai'i. Celebrating the Soundtrack of Hawai'i began with the 35th Anniversary concert of Cecilio and Kapono at the Waikiki Shell in 2008. Billed as a Back in the Day concert that reminisced about the good ole days and the music that took us back to the days of our youth, numerous local celebrities joined C&K on stage and filled the night sky with many of Hawaii's favorite melodies. Over the years, Henry and Friends has continued with Back in the Day concerts and recently performed at Hawaii's new Jazz venue – the Blue Note in Waikiki with Friends. Helping Henry Celebrate the Soundtrack of Hawaii has been many of Hawaii's well known media celebrities like Biily V, Mele Apana, Lina Girl, Mileka Lincoln, and Lanai Taruba to host the shows and comedians Frank Delima, Andy Bumtai and Kaleo Pilanca to keep the stroll down memory lane fun. And joining Henry on stage have been Kalapana, Sistah Robi Kahakalau, Amy Hanaiali'i, Cyril Pahinui, Ledward Kaapana, Sean Na'aauo, Jerry Santos, John Cruz, Brother Noland, Keola Beamer, Theresa Bright, and Na Leo. Even younger generation musicians like Raiatea Helm, Taimane Gardner, Aiden James and Mailani have all performed with Henry and Friends. 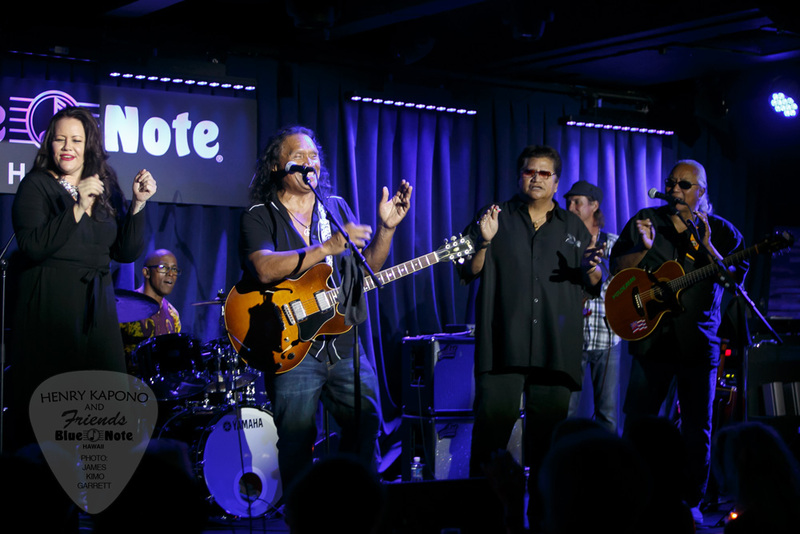 Henry Kapono and Friends Alx Kawakami, Gaylord Holomalia, Johnny Valentine and Blayne Asing celebrated the music of Cecilio and Kapono at the Blue Note Hawaii. With 2 shows nightly, December 8-10 2016 brought back memories to sold out audiences in Hawaii's premiere venue for imtimate music. Mele Mei is the celebration of Hawai'i's music, hula and culture and Henry Kapono and Friends performed a one night, two show gig in the Blue Note showroom. The second annual Hawaii for Hawaii concert featured entertainment by “Henry Kapono & Friends” and raised almost 750,000.00. Hawaii News Now produced and promoted an inspiring live broadcast across its three network stations and online. Additionally, a celebrity telethon and live check presentations by generous contributors allowed national and local viewers to participate and donate live.